There are thousands of places inside the Big House that have significant memories for Wolverine's fans over the years, where I happen to be standing, probably not one that they look back on too fondly, at least Spartan fans are rejoicing about it, but it's a play that changed the rivalry, at least moving forward, and is something no one can forget. Where were you when you heard this call? "Whoa he has trouble with the snap, and the ball is free! It's picked up by Michigan States's Jalen Watts-Jackson, and he scores! On the last play of the game! Unbelievable!" "I was sitting in the press box at Michigan Stadium in the front row there looking right out, Mitch Albom was sitting to my left and a guy named Justin Rose was sitting behind me, and were already clacking in smart Alec tweets and whatnot and the games just about to end, and this unbelievable play unfolds in front of us and I'll still maintain it might be the craziest play in the history of college football," Michigan historian and author John U. Bacon recalled. "I turned back to the field and saw the play and I started looking for flags, that's got to be a penalty, somewhere, something, and then we heard the Michigan coaches screaming profanities, smashing the wall heading to the elevator," Michigan State historian and author Jack Ebling added. 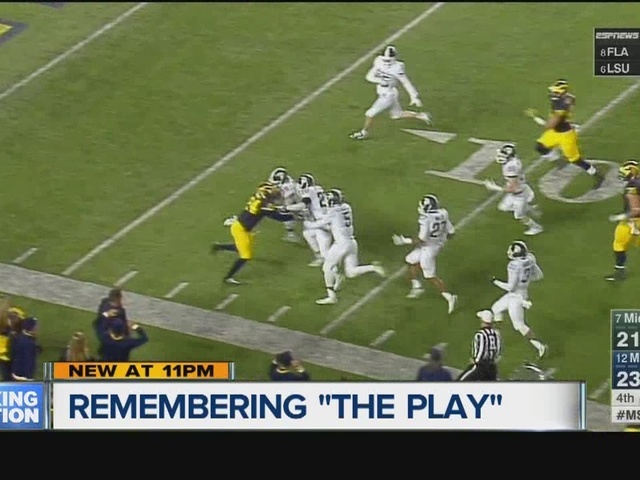 What makes this such a fascinating part of the rivalry is that we're just touching the tip of the iceberg of its significance, historic moments intensify over time, as this play left a bruise on the Wolverines, while Spartans still chuckle each time they see it. "Well be talking about this play 100 years from now, if they're still talking about college football, they'll be talking about that play 100 years from now, that's how big it's going to be," Bacon added. "It's intensified because it had Championship implications, because of the rivalry, because people see each other everyday at the water cooler, so that play will never be forgotten. If Michigan wins nine in a row and win a game by 5 touchdowns, it doesn't erase the feeling people had that day," Ebling said. Now this isn't the first preposterous play in college football history, the Auburn-Alabama 109-yard missed field goal then returned for a touchdown "Kick 6" a few years ago was similarly insane. And folks from the golden generation to this day remember the infamous band Cal-Stanford contest from 1982, where the band was on the field. The common theme from all these plays is this, these rivalries have only intensified from defining plays and with this being from the first game between nationally renown coaches Mark Dantonio and Jim Harbaugh, buckle up sports fans, were in for a ride. "I think it sets it off between Harbaugh and Dantonio, as long as both those guys stay at their schools, this rivalry I think is going to be phenomenal, this is going to be the golden era of the rivalry," Bacon added. And while the teams are certainly playing for different goals in the 2016 version, one thing can be for sure, both teams are hoping to go 1-0, this week. "My hope is that we flip things around a little bit for our senior class and for our football program in general," MSU head coach Mark Dantonio said. "What you did before means nothing, now you're doing it again and that's the time that counts," Michigan head coach Jim Harbaugh added. Kickoff for the 109th meeting, noon on Saturday.